(Money magazine) -- You managed to glide through your twenties and thirties without any major health issues. Yet, as the calendar pages turn, you're finding that a host of minor -- and perhaps a few major -- medical problems keep cropping up. The doctor shakes her head when she sees your blood pressure and cholesterol numbers. It's inevitable: As you age, aches and pains appear, and your body costs more to maintain. A regime of blood pressure medication, for example, can easily run more than $1,000 a year. Fortunately, you don't have to choose between saving yourself and your wallet. Money magazine gives you strategies to cut your costs as much as 70% in six big areas -- from doctor visits to prescription drugs to dental care -- that are major sources of cash drains. 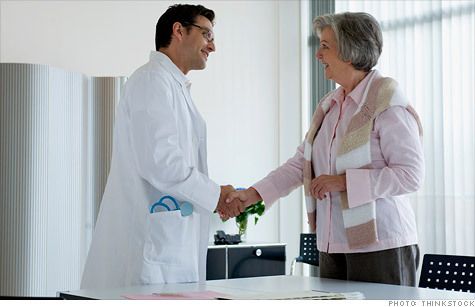 This is the first of a two-part series on how to lower your medical expenses. The annual doctor visit may well be a memory of your youth. About a third of Americans at age 50 suffer from one or more chronic conditions like high cholesterol, diabetes, or high blood pressure. These types of ailments may require doctor visits as often as every three months, says Glen Stream, president of the American Academy of Family Physicians. Multiple visits can add up, even if you stay within your provider network. More employers are pushing high-deductible plans that leave you on the hook for the full cost of visits until you hit that deductible (averaging nearly $3,700 for families and about $1,900 for singles, according to the Kaiser Family Foundation). Many are also switching from co-pays (a flat fee per visit, usually $20 to $30) to co-insurance (a percentage of the bill, averaging 18%). That can cost you big, especially if you're seeing specialists who are likely to charge more than a primary-care doc, says Martha Gaines, director of the advocacy group Center for Patient Partnerships in Madison, Wis.
Keep tabs on your vitals. Often visits to the doctor are to monitor your condition -- rather than actively treat it. Cut down on the number of these visits -- and the accompanying co-pay or co-insurance -- by doing similar checks at home. Home-testing kits for many conditions these days are reliable, easy to use, and fairly low cost. A quality blood pressure monitor runs $30 to $140; at-home glucose kits $20 to $130. Your insurer may reimburse you for the cost of these items as long as your doctor writes you a prescription for them. Make an offer. If you haven't met your deductible yet or have costly co-insurance, see if your doctor will cut his rate if you pay in cash. Need to see an out-of-network specialist? Your insurer may still cover the cost at the higher in-network rate as long as you can prove that your plan doesn't have a specialist with the expertise you need, or has an inadequate number of specialists in your area. If not, offer 35% less than the charge (about what he'd recoup from your insurer). Chronic conditions mean drugs -- about 65% of Americans ages 45 to 64 report taking a regular prescription, often for conditions such as high cholesterol and depression. Sweeping changes that many employers have been making to drug coverage might stick you with a higher cost -- or a golden opportunity to cut your bills. About a quarter of large employers now use some kind of co-insurance for medication -- traditionally they'd been strictly attached to co-pays -- a change that can add several hundred dollars more a year to your bill. On the plus side, nearly a quarter of companies are reducing or eliminating employee charges for medications (such as cholesterol-lowering statins) for chronic diseases. More traditional tiered systems are still widely used, under which you pay one rate for generic drugs (average of $10), one for "preferred" brands, and the most for nonpreferred (average of $50), according to Mercer. Coordinate coverage. Scrutinize your plan and your spouse's (assuming you both work and have access to employer plans) to see which offers the better deal. Check whether your drugs are on the preferred list; nearly 25% of large employers are restricting or eliminating coverage of popular brand-name drugs. Also note restrictions for drugs you suspect you may need; more plans are requiring prior authorization for new prescriptions, or mandate that you try another drug first before they'll pay. Be a cheapskate. A growing number of employers now offer a no-pay plan for certain drugs (Pitney Bowes, for example, eliminated co-pays for statins for certain employees and reduced them for an anti-blood-clotting drug.) If your company is among them, you may be in luck. Got the plan but your meds aren't on the list? Ask your doctor if you can safely switch to one that is. You may also find generic drugs priced lower than your co-pay; plug the drug and your location into GoodRx.com (also available as a smartphone app) and the site spits out retail prices at local and online pharmas as well as big-box stores (Target, for example, sells many generics for just $4). Otherwise, mail order is likely to be your cheapest option. Most mail-order pharmacies give you a 90-day supply for the price of two 30-day supplies at the retail pharmacy, according to Express Scripts, but the discounts can run as high as 70%. Change your chemistry. Sure, you know that diet and exercise can help you manage high blood pressure, diabetes, and other common chronic conditions. But you may not be aware just how much they can help your wallet as well. For example, research shows losing even 7% of your weight may reduce your blood pressure enough to go off the meds. Your insurer may help out: Most will cover a nutritionist if your doctor prescribes her services to help you manage a condition like Type 2 diabetes, says Barry Schilmeister, a senior benefits consultant at Mercer. You haven't been tested this much since you took your SATs. Whether you're monitoring a chronic condition or checking out the cause of your back pain, you're probably undergoing diagnostic tests such as MRIs, electrocardiograms, or stress tests. That's in addition to the gamut of preventive tests recommended for middle-aged folks, including mammograms, osteoporosis screening, and colonoscopies. Thanks to health care reform, certain preventive tests are free to you as long as you use an in-network provider. Lab work is typically a $20 co-pay in-network. For diagnostic tests like ultrasounds, most insurance plans will ding you for 20% co-insurance (in network) and 40% (out of network) after you meet your deductible. Someone struggling with back pain might get an X-ray or an MRI, with 20% of the bill costing a couple hundred dollars. Limit your tests. Unless you or your doc have reason to suspect a more serious condition, imaging tests usually aren't necessary as the first step in treatment for joint and muscle aches and pains, since the tests generally won't change the treatment plan. MRIs also often turn up unrelated degenerative issues, says Joel Press, a physiatrist at the Rehabilitation Institute of Chicago. Instead, doctors typically initially recommend a regimen of ibuprofen and physical therapy. If a doctor refuses to see you until you have had an MRI, find another physician. Seek out a low-cost provider. If an imaging test isn't avoidable, search your insurer's website for a list of in-network imaging providers. Then call the facilities and ask what they'll charge for the procedure, says Press. "The cost variation in many locations is pretty dramatic," says Mark Olson of Towers Watson. According to Change Healthcare, a CT scan of an abdomen in the Northeast can run as much as $1,460, which would cost $292 with 20% co-insurance, or as little as $480, which would cost just $96. Use the right label. A colonoscopy ordered as a diagnostic (say, if you go to your doctor with an abdominal complaint) will cost about $200 to $600 for someone with 20% co-insurance. Don't be shy about asking your doctor or the testing center to use the preventive code, if it's a screen you should have as part of routine care for someone your age (keep in mind that if your doctor winds up performing another procedure in the course of doing a preventive test -- say, a polyp is removed during that colonoscopy -- you could be billed for a portion of the exam). See the list of tests recommended for your age and health status. Additional reporting by Zain Asher-Ejiofor.